Kell Brook will need to undergo surgery tomorrow after his mauling at the hands of Gennady Golovkin. At around 3am today, the boxer tweeted:" I'm out of hospital need op next week but will be fine and I'll be back. Sorry I couldn't bring it home tonight." Promoter Eddie Hearn later said the op on his right eye would take place in Sheffield on Monday. "Thanks for the messages, Special K Brook now left hospital - confirmed broken eye socket op on Monday in Sheffield," Hearn tweeted from his official Twitter account. Brook's hopes of surprising middleweight king Gennady Golovkin were cruelly crushed as the Sheffield welterweight world champion was stopped in the fifth round at London's O2. 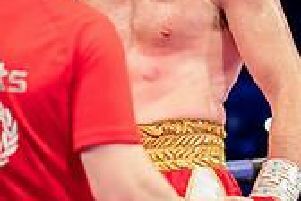 Trainer Dominic Ingle threw in the towel as the South Yorkshireman took a pounding like he'd never had before. The scale of the defeat sustained the argument of nay-sayers who had forecast Brook would not be able to withstand GGG's power at two weight divisions higher than he is used to. Before Brook was taken to hospital, he spoke of his intention to return at 154lbs, and revealed he had suffered a suspected broken eye socket. "I expected him to be a bigger puncher," he said. "In the second round he broke my eye socket but I was tricking him, I was frustrating him. I was starting to settle into it but when you see three, four, five of them it's difficult. "I hurt him, when you're in the fight you can see, his legs buckled a little. But I'm not taking anything away from Golovkin, I would fight him again, with a good eye. When you see five of them against a great champion, it's tough. "I would have to go back to the drawing board, I'd be most suited at light-middle. I know (Liam) Smith and 'Canelo' (Saul Alvarez) are fighting next week: I would love the winner. "It wasn't my night because there was much more to come from me but I was seeing five of them out there. "I'm a warrior, I want to carry on, I was ready to fight on. Anyone who trains with me knows that. "I was starting to come on. We knew the first five or six rounds would be tough, but you would have to talk to my coach to ask him why he pulled me out. I'll be back." Despite Brook's repeated success in landing punches, Golovkin insisted he was not hurt and spoke of his desire to fight Billy Joe Saunders. "I knew that Kell was a very good fighter," he said. "But he's not a middleweight. He's just not. I respect him, because he is very good, but he's not so strong. He didn't hurt me at all. There were a lot of punches, but I didn't feel them. I respect Kell. And thanks to his corner. "Now I want a unification fight. I would absolutely come back to the UK to fight, and I would like to fight Billy Joe Saunders for his belt. But I am open to everybody." Ex-world heavyweight champion David Haye said: "I was so happy Kell Brook's corner took a compassionate stance. I was in the same position once and seven fights later, I was world champion. "Us boxers are the last people to know. You don't know when you're in there that you can't win."